Add a stylish bar stool to your home with the Amish Bar Stool. Offering a stylish contemporary modern look, the Susan Bar Stool has back legs that curve out to the back for a unique look. For comfort, this solid bar stool is crafted with a saddle scoop seat and a Queen Anne back so you can sit and rest your back while you enjoy a cocktail with family and friends. Customize this stationary bar stool by selecting the swivel bar stool option. 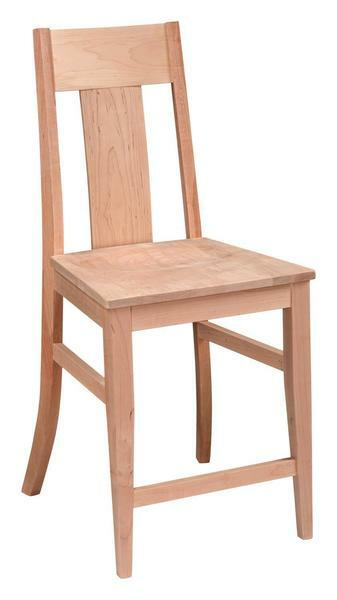 This lovely solid wood bar stool is also available in counter height to accommodate your needs. Order wood and stain samples online today or call one of our Furniture Specialist for assistance in selecting the right wood and stain for your home!